Privately owned by Jeffrey Ruddell, an aviation enthusiast, Whitsunday Airport offers visitors and the local community one of the most diverse and sophisticated general aviation airports in the whole of Australia. Every year the airport welcomes over 130,000 passengers on tours, transfers and adventure flights, that's some achievement. If you're taking a trip out over the reef, or maybe one of the skydiving packages, chances are you'll be taking off and landing again at the Whitsunday Airport. This is the home of Helireef hosted helicopter tours, tours over the Great Barrier Reef, Whitehaven Beach, Whitsunday Islands, Airlie Beach and Daydream Island. You'll also find Air Whitsundays, GSl Aviation and Tiger Moth Adventures who offer the opportunity to experience timeless tiger moth joyriding flights over the Whitsundays. Tandem Skydive - Airlie Beach are also based here, these are the people that give you the opportunity to skydive directly over the incredible Whitsunday Islands with Australia's most experienced skydiving instructors. 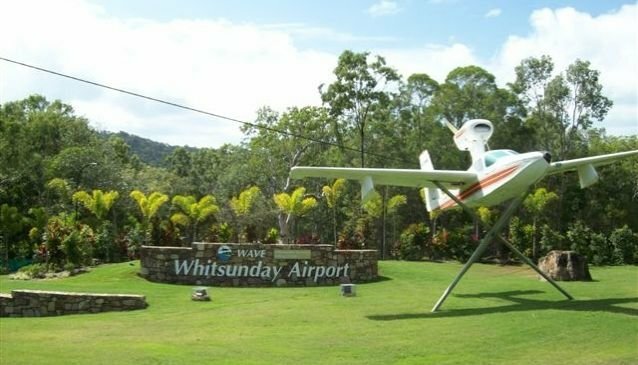 Small but perfectly formed, the award wining Whitsunday Airport is a pleasure seekers paradise.